One of our sites that needed updating was our Ouya Site, its now sporting a new silver look, with the new site design we are using on all our sites. OUYA has unlocked a major achievement today: the teensy crowdfunded gaming console is now available at retail, after a slight delay from the June 4th date it promised earlier. That's good news for everybody, except perhaps some of the original Kickstarter backers who've still not received their consoles -- though founder Julie Uhrman said the firm is "working overtime" to resolve that issue. As for the retail OUYA package (which has had most of its flaws ironed out since we first saw it) it'll come with the game console, controller, an HDMI cable and batteries for $100, with extra controllers running $50. It's already sold out at Amazon, but you can also seek it out online or in person at Best Buy, GameStop, Target or GAME. If you're still undecided, make sure to read about our hands-on experience with the device. 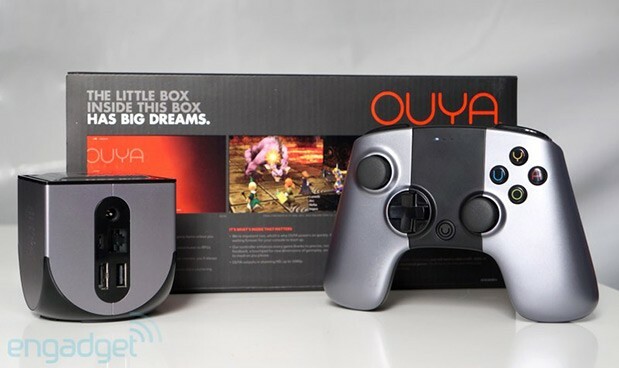 The forthcoming Ouya console may become a destination for emulation of classic games. According to a post on the Ouya forums, the leading Android emulator developer Robert Broglia is bringing "all" of his work to the platform. Broglia's work includes emulators for GameBoy Advance, GameBoy Color, Sega Genesis/Mega Drive, Sega Master System, Sega Saturn, NES, SNES, N64, Neogeo and Atari 2600. The first to launch will be Snes9x EX+, which promises , "near complete game compatibility." Broglia's interest in the Ouya helps to answer one of the major outstanding questions around the validity of the platform: the availability of games. In February, former thatgamecompany exec Kellee Santiago was hired as head of developer relations for Ouya. "Ouya gets it," said Santiago at the time. "This is the first console company that really understands how important it is to remove the barriers to development. By freeing up the development process, Ouya is opening up new doors in console gaming." Portal developer Kim Swift was also confirmed to be developing a game for the platform. Upcoming Android console Ouya will likely have SNES and NES emulators ready for day one, reports claim. CVG reckons that “signals within the emulation community” point to a NES emulator being up and running for the console’s launch. Work on a SNES emulator is also progressing fast. Emulation could possibly lead Ouya toward legal hot water, with Nintendo unlikely to be happy with a rival machine offering much of its back-catalogue for free when it is still trying its hardest to monetise it. Of course, it’s hard to see how this situation could be avoided. The open nature of Google’s Android OS means that emulation is always going to be popular. Indeed, emulation of older consoles is rife on Android smartphones. We're getting closer and closer to the launch of the much-hyped OUYA console. The Android-powered gaming machine will start shipping to backers on March 28th and to celebrate the company is having a little shindig in San Francisco that will serve as a proper "unveiling." The invite just arrived in our inbox and hopefully this will be our chance to see the final hardware ahead of the June retail launch. The startup doesn't seem to just be pitching this as a massive media event either. The tagline on the invite reads, "there would be no OUYA without you." And apparently simply "saying thank you isn't enough." Aw, shucks, you're welcome OUYA. Tiny hackable Android console Ouya is now taking game submissions in preparation for the hardware’s launch on March 28th. Any games uploaded by developers before the date will have their titles available for sale when the console is released, should they pass the approval process. A number of developers had uploaded games during a recent test period of the Ouya marketplace, but the store has now been reset in anticipation of a new wave of titles. Although the console will be released to the hardware’s Kickstarter backers from March 28th, the console will not launch for general sale till June. The Ouya game console will launch at numerous US retail chains in June, including Amazon, Best Buy, Target and Gamestop. Backers of Ouya's Kickstarter campaign - more than 68,000 people - will receive their units in March, but the retail launch coming so soon afterwards will be warmly received by developers creating content for the platform. Pre-orders for the console started yesterday, at a price-point of $99.99. Each console comes with a touch-pad controller, though additional controllers will be sold for about $49.99 each. "We want to support Ouya as best we can, both online and in physical retail, making sure there's visibility for the product, to see content and demo the box," said CEO Julie Uhrman in an interview with the Wall Street Journal. "Those are all conversations we're having with retailers. Retail partners of this size don't just jump into business with every company that has something to sell. We're providing something that has responded so well to gamers and developers." When asked about the number of developers creating content for Ouya, Uhrman was somewhat evasive. However, she insisted that the platform will deliver, "inventive and creative [content] that has never been on the television." The support of major retailers, she claimed, is proof of the product's viability. "This announcement...is that we now have more than just dreamers behind us, we have established companies that do their due diligence that believe there's an opportunity for bringing great content back to the television." Codezombiegames has released a walkthrough of its new Android console. The video shows an in-depth overview of the Ouya development kit and features the studio’s own Deadly Dungeons title in action. Ouya is an android-based gaming system that plugs into a television set, enabling the user to play Android games and apps. It will run on a Tegra 3 quad-core processor and will support cloud gaming service OnLive. Developer kits have been available to game studios for the last few weeks and the system is set to launch in April. The Ouya will cost between £70-£127 depending on how many controllers you want. Ouya's game lineup is growing in leaps and bounds in the run up to next March's consumer launch of the Kickstarter-funded Android-powered game console, and developers are just about to start receiving pre-launch dev units. 10 lucky new developers just got added to the list of those receiving dev units, and even better: all 10 are getting the unit for free (an $800 value), after having been chosen by the company across 10 days of giveaways on Twitter. Another Kickstarter success story, Fist of Awesome, was the first game picked, and the contest closed out this morning with Starbound winning the final giveaway. Developers should receive their consoles in the coming weeks alongside dev console pre-orders -- the main, $99 console arrives in March 2013, and should you be able to wait, every one of them will also serve as development kits. The full list of new titles is just below -- and yes, one of the gamesdoes feature uppercutting bears as a main mechanic. Stop worrying. The eSfere video game console has made its way onto crowd-funding site Idiegogo and intends to bring Android apps to your living room TV. “Mobile apps have transformed the electronic gaming ecosystem. Each week thousands of new titles, with remarkable graphics and audio, are available for smartphones and tablets for low prices or even free,” reads eSfere’s Indiegogo page. The console boasts a Tegra3 quad core processor or above, 2GB RAM, 16GB internal flash storage, two USB ports, Bluetooth, Wi-Fi, Ethernet, HDMI connection for up to 1080p HD, multitouch gamepad controller with integrated accelerometer and gyroscope, and Android 4.1 operating system. The gamepad controller is designed to keep the touch surface experience of a mobile device, but those who have longed for physical buttons on their tablet or smartphone will be pleased to hear that the eSfere controller comes with a set of detachable silicone buttons and d-pads to easily adapt to your favourite games. This console is potentially good news for both gamers and developers. Users can pay a relatively small amount for an app-port of an AAA game and play it on a big TV, and developers don’t need to make special adaptations, just continue making Android games as they normally would. The eSfere needs to raise $390,000 by January 21st. Check out the eSfere Indiegogo page to find out more.